SouthWaste was founded in 2004 by GulfStar Merchant Banking and Company management as a platform for creating the premier provider of non-hazardous liquid waste collection and processing services. 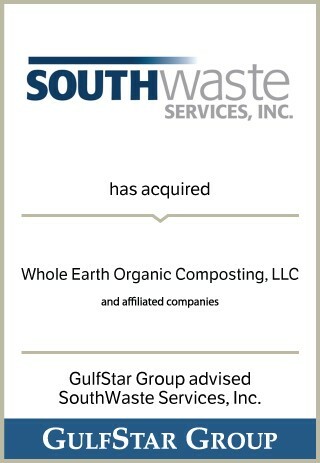 Since that time SouthWaste has closed and integrated eight acquisitions covering the markets of Houston, Dallas-Ft. Worth, Austin, San Antonio and Lubbock, Texas, Atlanta, Georgia and central Florida. Primary services include vacuum removal of waste from grease traps at food services establishments such as restaurants, grocery stores, schools, hospitals and prisons; removal of residuals from municipal water treatment plants and septic systems; and processing of these waste streams for final disposal.